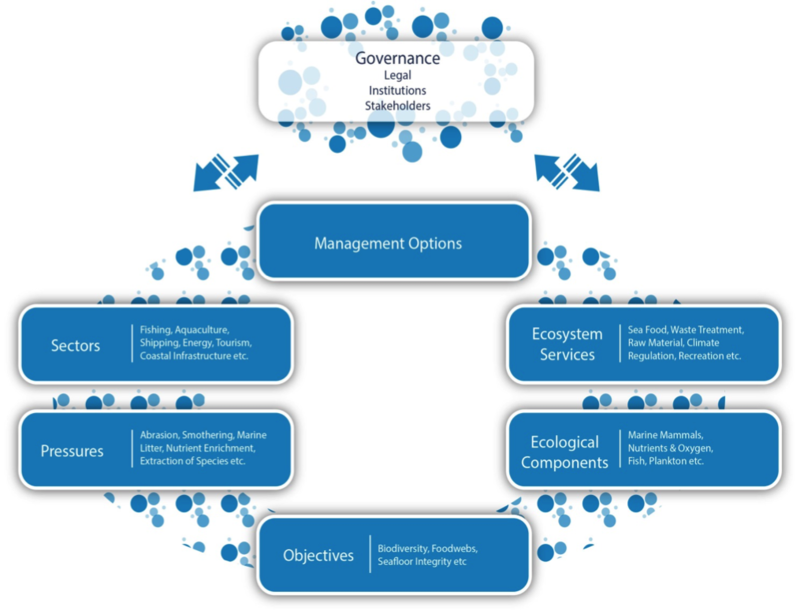 ODEMM focuses on the structure, tools and resources required to choose and evaluate management options that are based on the principles of Ecosystem-Based Management (EBM). The approach proposed is one which can translate policy driver objectives to an operational process of creating, appraising and choosing management options to inform decision makers. The ODEMM Linkage Framework can be used to identify all of the links between sectors, pressures, ecological components and Marine Strategy Framework Directive’s Good Environmental Status Descriptors. The Linkage Framework gives a holistic overview of all the potential interactions in the system. To develop this further, the Pressure Assessment can then be used to begin to weight the impact of the sectors and pressures which occur. The Pressure Assessment illustrates a broad picture of all the pressures that occur together in a system. It may also be useful to further rank these pressures in some way to prioritise management. The Risk Assessment quantifies the Pressure Assessment results and can give a relative risk value of pressures in the system and which sectors contribute these.